Have you ever dropped something in the water? Are you looking for lost “treasure”? The PADI Search and Recovery Diver Speciality course will teach you effective ways to find objects underwater and bring them to the surface. Search and recovery dive planning, organisation, procedures, techniques and how to deal with potential problems. How to locate large and small objects using search patterns. 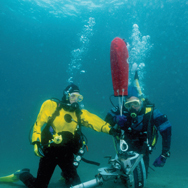 How to use a lift bag and other recovery methods. Be a certified PADI (junior) Advanced Open Water Diver. equivalent certification from another organisation.